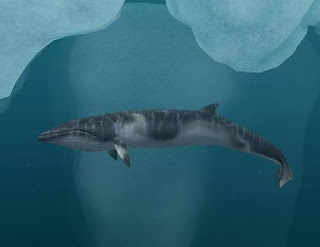 Japan's commercial whaling fleet, thinly disguised as 'scientific research' killed another 333 Minke whales (Balaenoptera acutorostrata) in the Antarctic's southern ocean this season unopposed by the conservation action group, Sea Shepherds. The organization usually sends its small flotilla to the southern ocean to harrass the whaling operation, but according to the organization's head the Japanese are employing satellite technology to keep track of Sea Shepherd ships, making it impossible for them to close in on the whaling vessels. Sea Shepherd has sent ships south to confront the Japanese whalers since 2005, sometimes risking dangerous high sea collisions. Minke whales enjoy a natural lifespan of 45-50 years. The Japanese returned to port on Saturday with their illegal haul of whales that included pregnant females. Japan's goal of defiance of international law is to eventually resume commercial whaling in earnest even though most Japanese no longer eat whale meat. Japan intends to take 12,000 whales over the next twelve years. Not coincidentally, the Japanese whaling port of Shimonoseki is in Prime Minister Abe's electoral district. Continuation of whaling in the 21st serves no pressing human need, and should be relegated to the annals of history, but inaction by Japan's allies allows the inhumane hunt to go on.